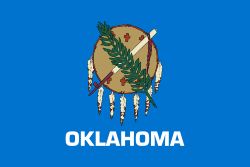 The following are people who were either born, raised, or have lived for a significant period of time in the U.S. state of Oklahoma. Henry Kravis, co-founder of Kohlberg Kravis Roberts & Co.
Hoyt Axton (1938–1999), country music singer-songwriter, wrote "Never Been to Spain"
Elvin Bishop, singer-songwriter; from Tulsa; hit record "Fooled Around and Fell in Love"
Steve Russell, Cherokee, poet, academic (emeritus professor), journalist and trial judge. Joe Redington (1917–1999), "Father of the Iditarod Trail Sled Dog Race"
^ "Forbes's The World's Richest People". Retrieved September 16, 2007. ^ "Academy of Achievement Biography". Archived from the original on February 13, 1997. Retrieved September 16, 2007. ^ a b Tulsa Gal Website. "Tulsa Founders: James H. McBirney. "June 20, 2010. ^ Poolaw, Rhiannon (August 31, 2016). "Last Wichita Speaker Passes Away". ABC News 7. KSWO. Retrieved September 1, 2016.